THE timing of the release of “The Ides of March” could not possibly be a coincidence. Adapted from the Beau Willimon play, Farragut North, the film opens in the United States today after making its North American debut at the 2011 Toronto International Film Festival. It had its world premiere at the 68th Venice International Film Festival, where it won the Brian Prize. 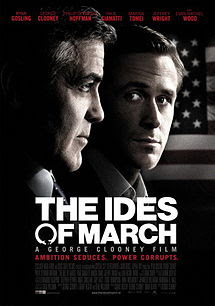 “The Ides of March” more or less chronicles the political baptism of idealistic, young campaign manager Stephen Myers (Ryan Gosling). Stephen works for presidential hopeful Mike Morris (George Clooney), is fired and then rehired with a promotion after he learns and applies the tricks of this dirty trade to his advantage. Underway amid the staffing snafus during a very competitive Ohio presidential primary is the usual political horseplay: backroom deals, backstabbing, blackmail, blackmail in reverse, betrayal, leaks, lies, damn lies and a death – political or otherwise. No doubt distributor, Sony Pictures Entertainment, is betting that audiences won’t be too disgusted with the current little horse-and-pony show on the road – the one known as the runup to the Republican presidential nomination – to pony up $10-plus for its little attraction. (How many more skeletons are rattling in Rick Perry’s closet). Stephen Myers (Ryan Gosling) finds himself in a political whirlwind in "The Ides of March." Photo courtesy of Sony Pictures Entertainment. GC also gets a producer, director and screenplay credit for "The Ides of March.” Aside from RG he has surrounded himself with strong support, including Paul Giamatti, Philip Seymour Hoffman, Marisa Tomei, Evan Rachel Wood and Jeffrey Wright. GC friend and colleague Leonardi DiCaprio is also one of the producers. “The Ides of March” is rated R for pervasive language.